Gango Editions is pleased to introduce an abundance of beautiful new floral pieces from some of our favorite artists, including Pamela Gladding and Amy Melious. Do you see an image you like but need it in a different size? We can help! All of our images are available as giclee fine art prints on paper & canvas in any size you need – please call us for more information at 800-852-3662. 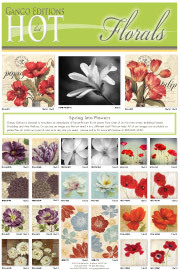 You can download our Floral Hot List here . Paul Brent is an artist whose paintings of coastal life and nature have gained widespread recognition both nationally and internationally. His passion for creativity has led to an expression both in fine art as well as producing designs for functional and decorative objects. Regarded as today’s foremost coastal artist he has always been intensely aware of his surroundings and his artwork reflects his wonder and admiration for scenes and objects of natural beauty. The following interview will explore the artist’s inspiration and method. customers. What do you see as the central appeal to your artwork? A. If the meaning of art is to impart emotion visually then I think the message of all of my art is to create the emotions of joy and relaxation in a world that is full of stress. I think this is possibly the greatest appeal of my artwork to those who buy it. My artwork not only fits in with people’s décor but often takes them away to a fond memory of a beach retreat or the simple pleasure of a moment in time that is a quiet getaway moment. This is what I have seen in my artwork and have had many comments from lovers of my art who have said the same thing. Q. How did you get on the path to becoming a professional artist? Was their a pivotal moment that made the difference in your success? A. I have been creating art since as early as I can remember. My mother was an elementary school teacher and always had a lot of art supplies around that she encouraged me to use when I wanted something to do. I began selling my art when a friend suggested I display my art at an outdoor art show in 1976. A pivotal moment came when buyers began asking if I had prints of my work. 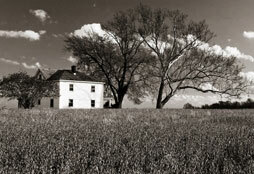 I started publishing prints and selling them to framers and galleries in 1986. My career took a big leap forward at that moment because I went from a local artist to selling my work around the globe in one year. Jeni Lee grew up in the countryside of Northern California and the lush forests of the Northwest. 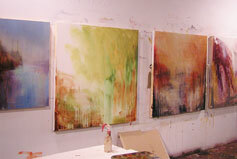 She attended artist residencies on the Oregon coast, in New Mexico and in Vermont, and she received a BA in Painting. 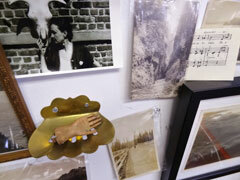 She quickly built a clientele base of private and corporate collectors. It was not long before her whimsical abstract pieces took fire in the mass market. Jeni is one of our best-selling artists and continues to bring new, creative pieces to the market. 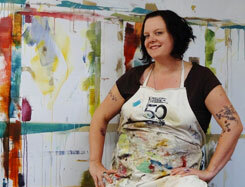 The following interview will delve into the artist’s background, work habits, and inspiration. Q: What do you see as the central appeal to your artwork? A: My artwork has always been fueled by strong design and inspiration from nature. I feel that most viewers are attracted to my fresh style and use of color, pattern, and texture, and are drawn to the unique ways I use materials in my work. I believe the attraction to my work originates in my playful approach to the art making process. Collecting inspiration is my creative foundation, whether that be through traveling to find new materials and ideas or experimenting with materials and following trends. Although I frequently rely on my natural and trained talents to make engaging art, in order to keep it interesting, I always invite possibility through chance and happy mistakes. That’s the magic of the process. As a talented colleague once shared, “If I knew what I was painting, it would ruin the surprise.” His words have been carried into each of my studios. It is this process, with my use of materials, that makes my work distinctive: Drips of wet color, brushstrokes of paint, smudges and marks of crayon, torn and crisp textures of collage. Through the use of these techniques, I am able to share my process with viewers, and they are able to acquire a more intimate feel for how the work is created. I create art that people can live with and be inspired by. A: I created my first abstract watercolor in high school. It was a small piece on paper with atmospheric tones of gold and yellow. It’s amazing to look at my work now as an adult and see that my style was with me then. It was at that age, I knew I wanted to express myself through creating beauty in art. Although I went to college to study art, I really learned to paint by painting. And painting a lot. Right out of college, I acquired my first art studio and made myself to show up to create every day. That routine, which soon grew to be habit, mixed with a few years of working in an art supply store, where I was able to play and discover with new materials, gave me the core foundation for who I am as an artist today. Q. When was the pivotal moment that your career took off? A. As an emerging artist, I began showing my work in local cafes and galleries and quickly found my work in demand. My first solo gallery exhibit nearly sold out. It was a very exciting time, and I believe my career took off from there. I began exhibiting in a variety of venues, such as art galleries, art street fairs and fundraisers, and found the time to travel, visit galleries and attend art residencies. I continued to cultivate relationships with clients, and quickly received commissions for unique projects for local hospitals and hotels. It was all to feed not simply the art itself, but my career as an artist as well. It was that taste of success which drove me to decide to be the working artist I am today. I believe much of my success is due to my dedication, motivation, and openness toward new paths and choices. Q. Have you ever been frustrated or surprised by a particular image? A. The great success of the “14 Friday” series has surprised me, but most of their success is due to the fact that their creation involved play, color, and instinct. Aside from deciding to create artwork involving large playful, organic circles, I didn’t have a plan for how I was going to make these. That’s the magic of the art process. There have been times when I have felt frustrated with a piece in process, and usually when that happens, I step away from it, maybe take a walk and return to it later. Or maybe I will start another piece. To avoid art that seems forced or overworked, I sometimes have to let it go and remember to paint from the heart to find the piece that sings. Q. Do you have a secret favorite? A. My secret favorites are the abstract landscape style designs, like “Skyline Symmetry” and “Blue Mood”. Early in my artistic career, I started painting the figure, then to landscapes. It is this series, with the atmospheric washes and playful patterns, that best reminds me who I am and was as a painter. Q. How do you keep the creativity flowing? A. What I treasure most about working for myself as an artist is that it allows me the time to travel. Exploration is my biggest inspiration for keeping the creativity flowing and for discovering new ideas. I’ve traveled to Italy for the amazing countryside, architecture and frescos; to the Southwest to immerse myself in the diverse landscape; to Hawaii and Mexico to gather insight on their cultures; and I often take day trips to the Oregon coast to refresh my creative spirit. 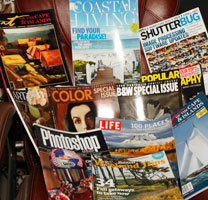 One of my favorite sources of inspiration has always been browsing images in home décor and art magazines. Even as a child I often made collages with my favorite paint swatches from the hardware store and fabric patterns from the magazines. It is exciting to mix new and vintage design trends and I love to get a peek in to how people are creating artful and inspiring living spaces with art, color, and design. Q. Explain how you bring skill, inspiration, and work together. A. Before I go into the studio, I collect all my sketchbooks, design notes, pictures, and anything else that may inspire an artwork. I surround myself with those sources of inspiration, keep them stacked on the table next to my coffee, tack them up on the walls of the studio. Usually in the morning, I begin to sketch out ideas, and I think about what color palette I am inspired by, while considering composition and what materials would make an interesting piece. Then I start painting. I work intuitively and just let go and make art! That’s where the element of surprise and the essence of good art begins. As I move along, I use my skills and talents to refine my work into a more cohesive piece: Add a color here, change pattern here, and enhance a section there. It is a dance between me and the artwork, until at one moment, it is done. Perhaps my success is due to the fact that my audience can see this moment too, when an artwork is completed, it sings and visually pleases and inspires. I am incredibly grateful for that. Q. What is your favorite time of year to create? A. The seasons significantly influence my creativity. The transitional spring and fall are my favorite times to start new bodies of work, or to begin a new project, for they bring an inviting sense of possibility and change. Often summer is my time to roam and refresh, while in winter, I am in the studio the most finishing and refining designs. A. Recently in the studio, I started a new series of atmospheric paintings with large color washes and drips of paint, inspired by the messy palette I use while painting. From there I may begin to integrate patterns and details, but I am not sure where the new series will take me. That’s part of the process and the surprise. A. 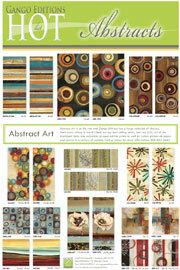 For the upcoming year, I want to continue my investigation with new color combinations and playful textures. 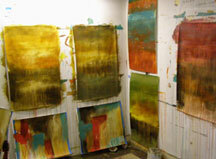 Layering paint, brushstrokes, and lines, with some of the new color trends I am seeing, excites me. I recently returned from a trip to New Orleans where I acquired an eclectic sense of expression: a place where the old truly mixes with new; where design is a historic mix of European influences with modern novelty. That style compliments my own artistic expression and I anticipate the new art that I will create from that experience. See all of Jeni Lee’s prints at Gango Editions here. Click on the image below to virtually page through our catalog. To download your own copy click here . She brings us a world of whimsical characters – chefs, waiters, bathing beauties…all to brighten your day. One of the most highly licensed artists in the world, Gango Editions is proud to have Jennifer Garant as one of our artists. Garant is a prolific painter, providing us with new pieces on a regular basis. Please visit our website at www.gangoeditions.com for our full collection. 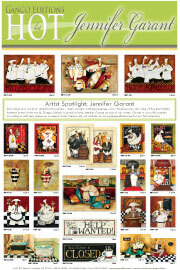 You can download the Jennifer Garant Hot List here . 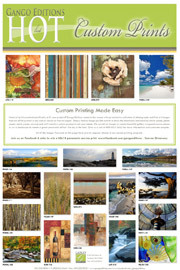 Need art prints created specifically to fit your projects? Gango Editions comes to the rescue with our extensive collection of photographs and fine art images that can all be printed in any size on canvas or fine art paper. Simply find an image you like and let us know the dimensions and medium (velvet paper, photo paper, matte paper, canvas) and we’ll create a custom product to suit your needs. We can mirror images to create beautiful gallery wrapped canvas pieces or cut a landscape to create a great panoramic effect. The sky is the limit. Give us a call at 800-852-3662 for more information and substrate samples. 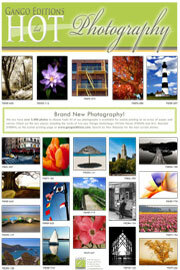 All of the images fe atured on this hot list have proven popular choices in our custom printing program. 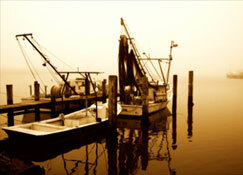 Join us on Facebook and enter to win a 62×18 panoramic canvas print. Visit our Facebook page throughout the week for new art.